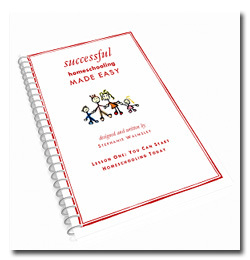 I had the opportunity to review a .pdf copy of the Successful Homeschooling Made Easy Course by Stephanie Walmsley of Successful Homeschooling Made Easy. Raising children is already quite the task. Once you add homeschooling into the mix, the task of raising children becomes that more challenging. I mean really, taking your children from zero knowledge to something other than that could not be that difficult. If you are a current homeschooler, you know the challenge is real. If you are a new homeschooler, you may or may not know what you are heading into as you begin your journey. In 1985, Stephanie Walmsley, was a new homeschool mom. By the time she completed home educating her last child, she had successfully homeschooled five children. The success did not come without a lot of lessons learned. 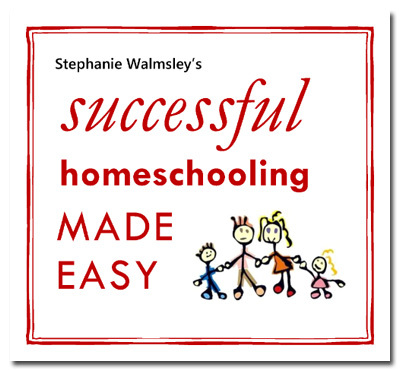 From her experience Walmsley has written a 26-week course, online course she hopes will help any homeschooler, from the novice to the seasoned one. Walmsley does not attempt to shape your school or how you conduct it, but rather shares the details that helped her eventually successfully homeschool her children. I received the first four lessons up front only because of the review. If you subscribe to Successful Homeschooling Made Easy, you will immediately receive the first lesson and future lessons are e-mailed to you once a week for the remaining 25 weeks. There are no additional purchases required. Walmsley provides you everything you need over the weeks of the course. You do not have to, but I would suggest printing the sheets for each lesson. Creating a successful homeschool environment does not come without study and quiet times. There are writing assignments in the lessons and you want to be able to spend time with your responses that work towards creating the successful environment. Even after homeschooling for more than five years, one of my biggest struggles comes from creating a schedule that works for the way we school. I had one that worked well when my children were younger, because there was less that had to be accomplished. As they continue to rise in grade level, figuring out how to educate everyone, and then with children on different grade levels is hard. Walmsley had me create an eight-week schedule in lesson one. We do not normally school on an eight–week schedule, but anything that could lead me to a more orderly day was worth the effort. Since we start out summer session next week, I worked on creating a schedule for that period. It looks great on paper, but we will see how well it actually works for us in the next few weeks. Lesson six touched on a neglected “subject”, the homeschool mom. It promotes “fulfilling your dreams” and to “take care of your children’s mother.” The point of “nurturing and developing my own growth” is something I have finally started giving more attention to. That is not with any discount to my children. Some of the other topics covered in the lessons are teaching, housekeeping and extracurricular activities. Those are general topics in which Walmsley goes more into detail, which really makes the program worth reading and learning from. You may prefer to have all of the lessons in hand, but there is a method to the way Walmsley presents her lessons. Being able to spend at least one week of time on each lesson will likely ensure you have properly implemented the new information she covers. There may be a book she wants you to read, questions to answer or other. Success is not rushed. All of the suggestions and tips Walmsley shares may or may not work for your family, but one thing that is for sure, you want to at least read her ideas, because Walmsley even offers a 30-day 100 percent money-back guarantee. Successful Homeschooling Made Easy Course is $10 a month or you may receive a 20 percent discount by paying in full at the time of registration and paying only $48.